These double-sided papers will add an extra flair to origami creations. Rather than a colored side and a white side, the back of the paper is an additional bright color, different from the front. 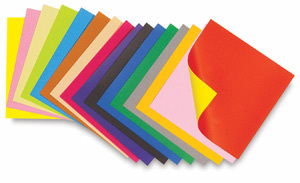 Assortment of 36 sheets in a variety of bright colors. ™ Aitoh is a trademark.